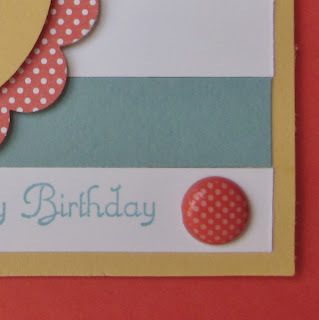 Today's Stampin' Royalty challenge is a scrapbook page. Whoa, scrapbook pages are definitely my weakness, but since I have been doing some pages for the upcoming Artisan Award in My Digital Studio, I am finding it much easier to do. 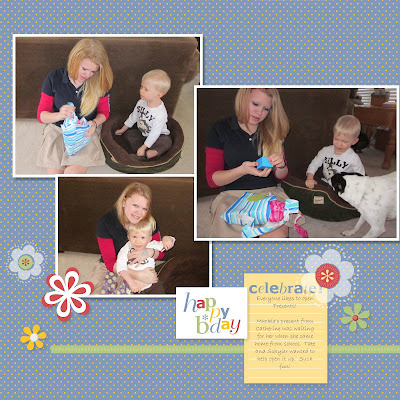 This page is a "standard" page that came with the Happy Bday digital scrapbook. I simply selected a page that I liked and did some tweaking around. Now there is a whole book that you can make, you just click to add pictures. So simple, and then you can send it off for printing! WOW, wonderful. I wanted to add three pictures on this page, so I moved everything down, added my pictures and added the picture borders, and drop shadows. I played with the flowers a little bit, and added my journaling. Total time from start to finish was about 15 minutes. Easy Peasy. You really need to try out the MDS, there is a free 30 day trial going on, so go to my ONLINE STORE and try it out today! Come back tomorrow to see the whole card, and what the challenge is! I love to read your comments, so let me know what you think, I will reply if your email is on the comment. Have a great day. I think your layout is great! I too run from Scrapbooking! I don't take pictures, and I don't scrap. I'm a purist card maker! Your two children are so gorgeous! Any chance your husband is blonde? This is full of summer cheer! And I am cheering you on for that Artisan Award for sure! I love the blocked striped background you did - sets off your card perfectly!